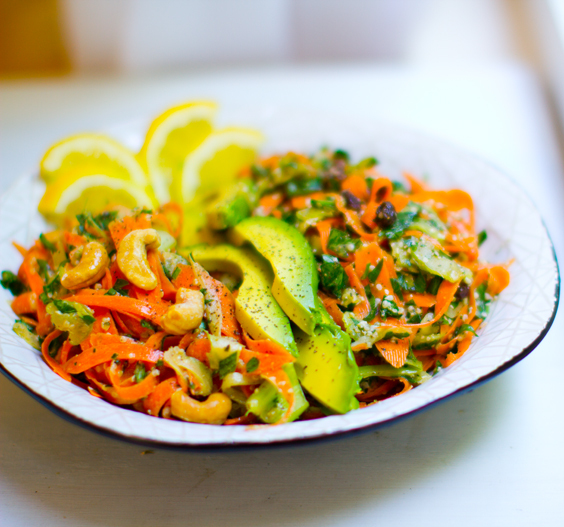 Shredded Carrot Salad Duo. His & Hers. 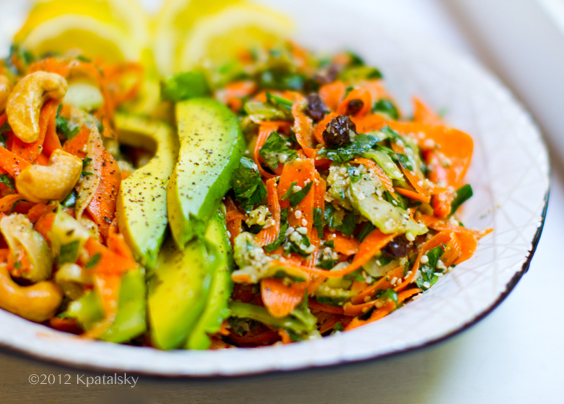 HIS & HERS, carrot salads. If only everything in life was so easily accommodated. He likes it spicy. Cayenne. 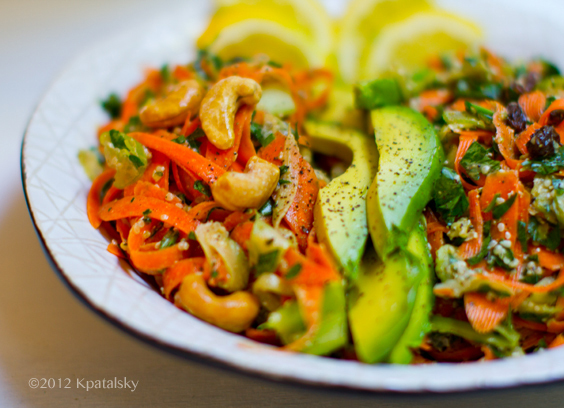 Roasted cashews. EVOO. Extra tahini. She likes it sweet, and sassy. Raisins. Extra lemon. Extra green. Plush hemp seeds. 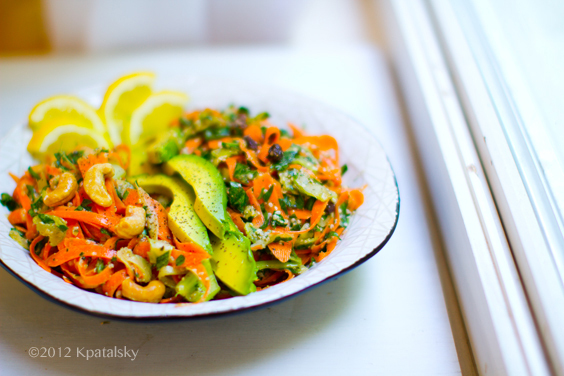 This duo of carrot salads fits into my life quite nicely. 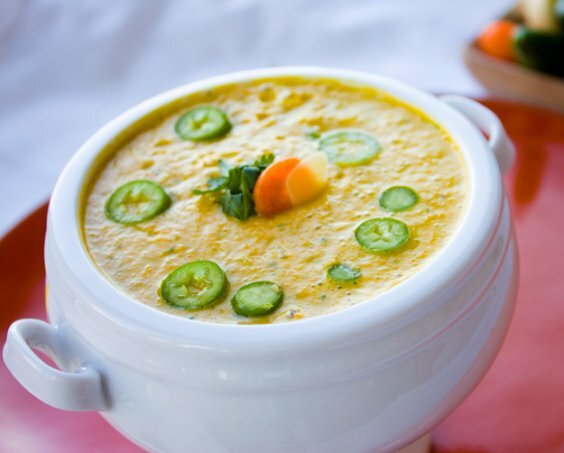 The recipes are similar, but with a few subtle modifications I can customize each recipe to suit different tastes. 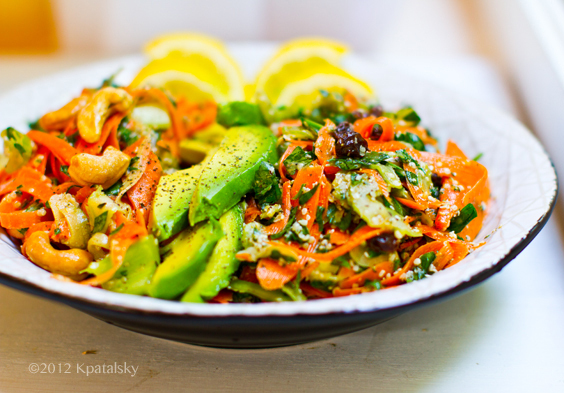 The clean flavors of shaved or shredded carrot + celery infused with lemon, tahini, black pepper and vibrant parsley shine through in both salads. His. 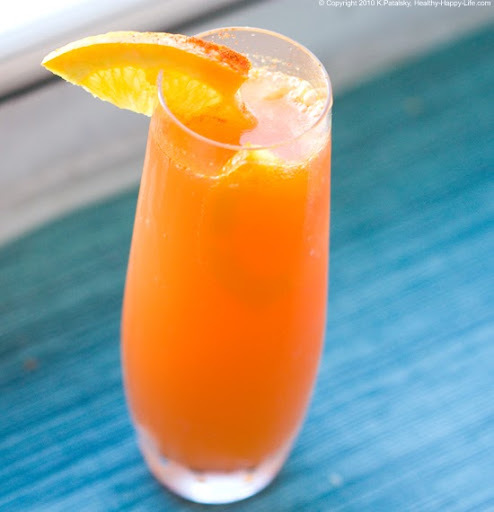 Spicy and smooth. 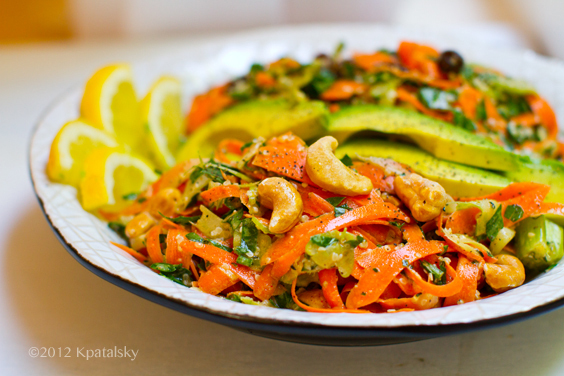 With an extra boost of cayenne pepper, a drizzle of extra virgin olive oil, extra tahini and a hint of nutty chopped cashews for some texture. An optional hint of smoked chili pepper spice. Hers. Sweet tender raisins and an extra splash of maple syrup mingle with the tangy fresh lemon juice and alluring bright lemon zest. An extra dose of pillowy hemp seeds and parsley too. Make it a meal. 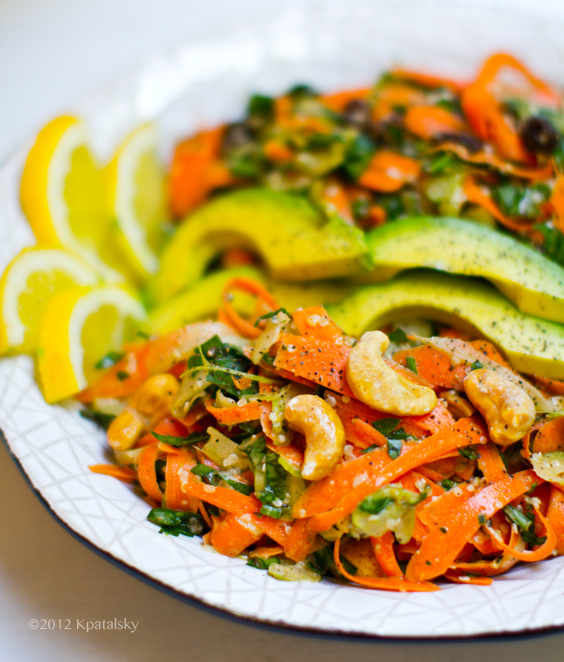 This salad is a wonderful side dish. I love it alongside a hummus pita (Spinach Hummus Pitas) - or any main dish using rustic beans like chickpeas or even some earthy lentils. Garlic hummus pairs perfectly with these flavors. 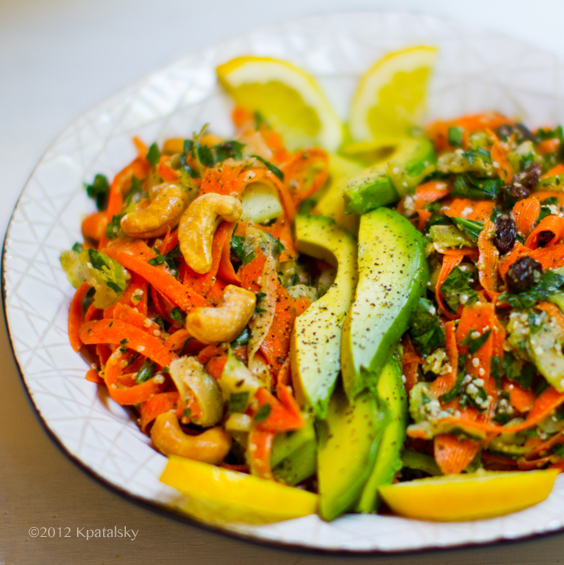 I served this salad alongside my sweet potato burgers. The baked patties with rustic beans and sweet potato paired nicely with the bright carrot and crunchy celery textures. Shred, Grate or Shave? I was just feelin' simple, so grabbed my easy hand peeler. You could use a box grater, mandolin shredder and even a fancy food processor. But I just grabbed my hand peeler and shaved the veggies into odd, long and wide, thin shapes. Worked for me! Serving Size: These salads make about 4-5 cups total. Enough to serve 2-3 large portions of up to 6 smaller side portions. Rich in vitamins A, C, potassium and iron. 1. Clean your veggies well - scrub your carrots clean to remove any residue. 2. Shave, shred or grate your celery and carrot. Chop up your parsley and zest your lemon. 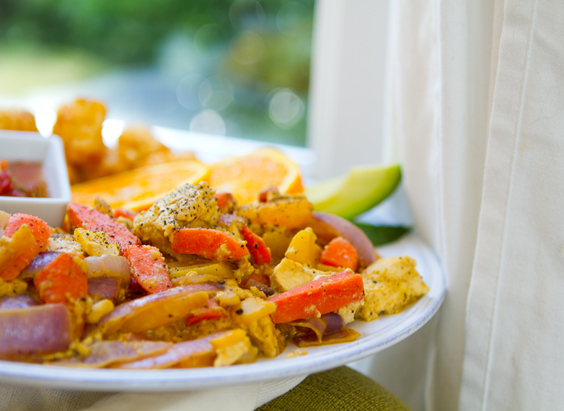 Toss all these veggies with the lemon juice and pepper. 3. Add in the seeds and any other ingredients - depending on which version you are making. Toss well. 4. 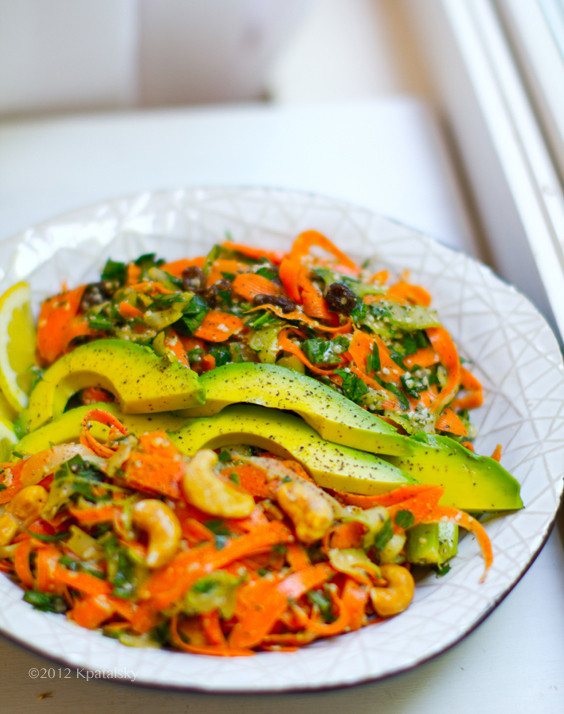 Place the salad in the fridge to chill and marinate for at least an hour. Store covered and eat within 1-2 days. 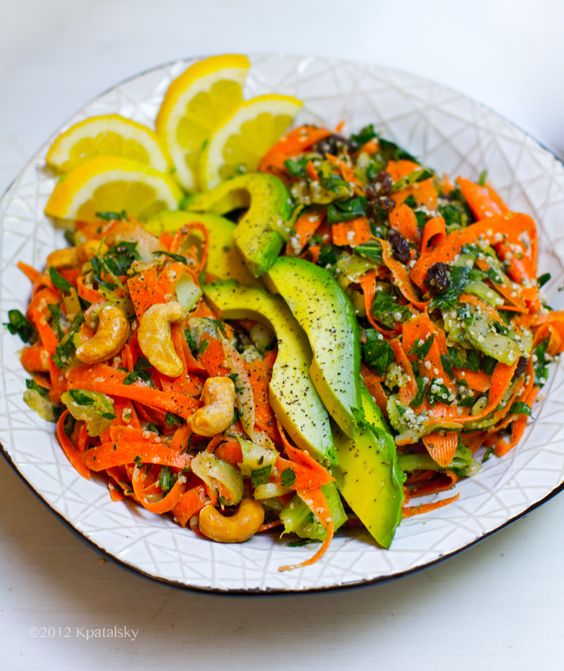 Serve with avocado and fresh lemon slices + fresh black pepper on top. 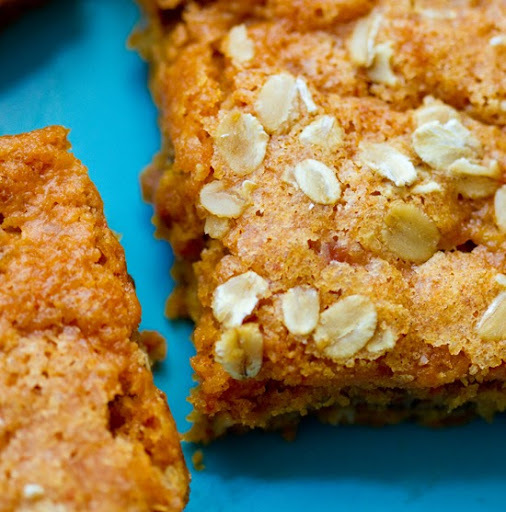 A few of my Carrot recipe links..
* Breakfast Carrot Cake Bars - Antioxidant infused!